Paleo Almond Butter Cups (V, GF, DF): a 5 ingredient recipe for rich chocolate cups stuffed with smooth almond butter. Paleo, Vegan, Gluten Free, Dairy Free. So apparently I have a thing for cups. But like, chocolate cups. Not just regular cups… I mean, I do have a soft spot in my heart for the soft blue North Carolina coffee cup I use every morning. And I do give a respectful nod to the sparkly tumblers that hold my kitchen tools when I’m baking (but I suspect they already know how awesome they are). Then there’s that extra sturdy cup that holds my cookie scoops and reminds me of my mom when she’s away. That cup is tastefully adorned in moose (mooses??) and shiny as fudge on the inside. She loves this cup because she can drink all the tea she wants and it never stains. But, what was I saying? 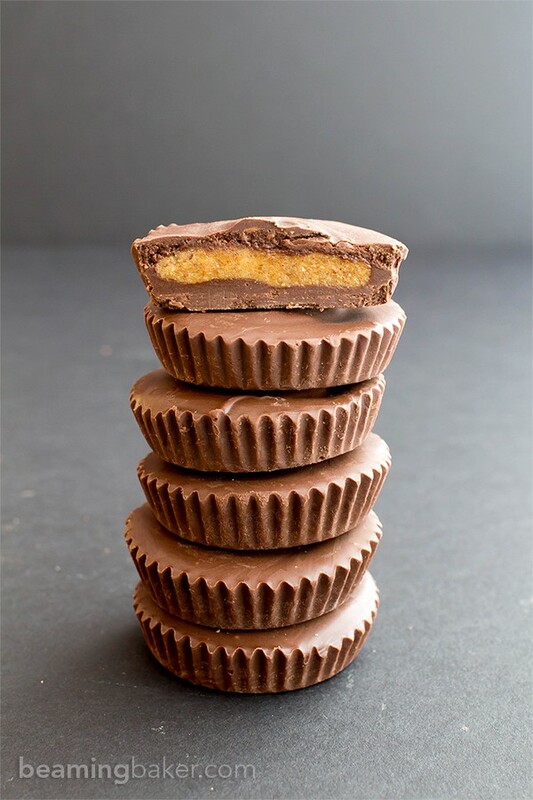 Oh yeah–I’m talking about chocolate cups here, folks. 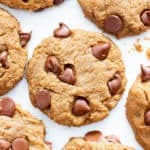 I just realized that there are already two other kinds of cups on the blog: peanut butter (of course) and cookie dough (I know). But it occurred to me that there weren’t any almond butter cups on this here blog. What a travesty, right? But I felt that there weren’t as many paleo treats as there should be ‘round these parts. Probably, but by probably I mean absolutely, why I created paleo Almond Joy and paleo chocolate almond butter fudge cups. So it was high time to bring my cup game to the paleo treats party. And by party, I obviously mean PAR-tay!! BYOT, ya know? Hopefully that only means bring your own treats… and not something profane my internet-naïve mind is unawares of. If it does, simply comment below and I shall immediately change this! Or not… because honestly all the acronyms mean something, uh… colorful as dictated by the interwebs. Anywho, I wanted to post these almond butter cups before Halloween hit, so everyone would have the chance to indulge in the treats they so enjoy and totally deserve. 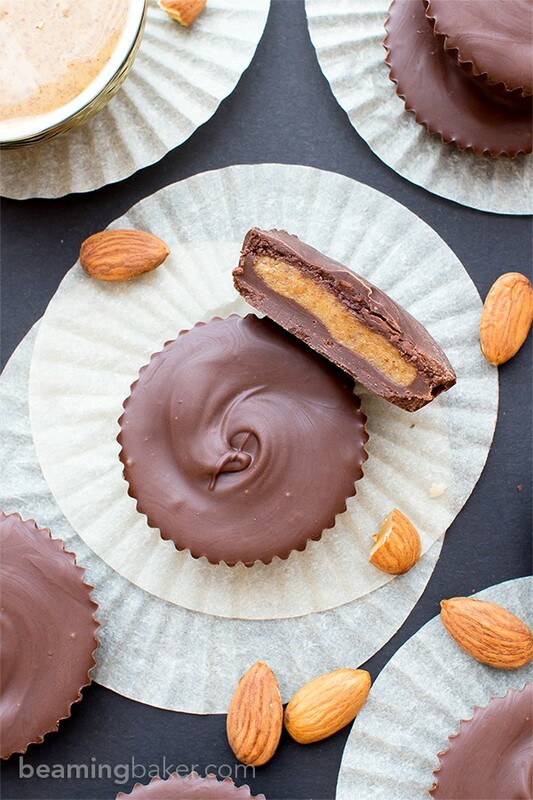 These paleo almond butter cups are based off of my peanut butter cups, but with slightly less chocolate to keep the AB/chocolate ratio more delicately balanced. Yes, I am a chocolate cup connoisseur. Please, also do not tell me chocolate cup connoisseur means some weird internet thing. Give them a taste and you’ll see what I mean. 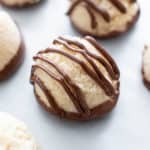 Heck, for those of you who can, make some of these almond butter cups and make some peanut butter cups, too! Taste test and let me know which you prefer. After all, you know chocolate cup connoisseurs like myself really like to “study” our art. Ahem. Plus, you’ll seriously be ready for Halloween, like, woah. You might also want to bake up a delicious batch of these paleo cupcakes by Texanerin. Because: cupcakes + candy = Halloween PERFECTION! Speaking of Halloween, have you purchased/designed/shipped in from France (if you’re cool like that) your costume yet? Some people get so into it, makes me wish I lived near them so I could check out their elaborate outfits! This year, and seriously every year, my family tries to plan a theme that we can all participate in. Things sometimes go awry and we don’t get all decked out like we want to. But this year, THIS YEAR, it’s gonna happen. I can feel it! The other day, Erik and I were chatting with my sister Jenny about our Halloween plans. Of course, PB (the nickname for my three-year old nephew) comes over and starts telling us about how he’s already picked out all of our costumes for this year. So he wants to be Bruce Wayne again. As for the rest of us, he’s picked the following: Jenny (his mom) as Wonder Woman (obvious reasons—Best Mom in the world! ), Erik as Superman (he seriously is such a goody two shoes–Clark Kent, not Erik ahem), me as The Hulk (don’t read into it—okaaaaaaay, I blame it all on that one recipe testing disaster), and Grams as—drumroll please: HAWKEYE. Hawkeye is a Marvel superhero who is extremely proficient in archery, etc. and has really great vision. As Erik points out, this is pretty ironic since Grams always sees one thing when there’s quite another. She doesn’t like her glasses, totally refuses to wear them, and at times charmingly calls all of us kids “four eyes” in Vietnamese. Plus, she only sees what she wants to see. One time, Erik and I were sitting down to dinner and were just getting ready to eat when Grams strolls by and says, “Oooooooooooh, what is that?? Chocolate??? Is that chocolate? ?” She starts smacking her lips while the two of us are looking around the table, searching for signs of chocolate. So Grams, with these paleo almond butter cups I can now say, “YES, these DO have chocolate and almond butter in them! !” And I will keep all bowls of black beans safely far away, where they will not yet again be misunderstood. Make a batch and feel the special pride that comes only from opening your own candy shop—okaaaay—the special pride that comes from making your own candy. It’s AWESOME. What are your plans for Halloween? If you don’t celebrate, what holiday are you looking forward to most? If you do, are you going to do a family-themed costume? Tell me all about it and send over some suggestions, I’d love to hear ‘em! 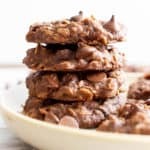 Paleo Chocolate Chip Cookie Dough Truffles – so east to make, so much flavor! Creamy Almond Butter – a great brand of almond butter that has a smooth, rich flavor. Coconut Flour – a serious paleo baking staple! Line a standard 12-cup muffin pan with cupcake liners. Set aside. Clear some space in the freezer for this pan. Make the filling: In a small bowl, whisk together almond butter, maple syrup and coconut flour . Whisk until well incorporated. When the filling gets harder to stir, switch to folding with a rubber spatula. Cover the bowl and place in the freezer for 15-20 minutes, allowing the filling to chill and harden for easier molding. Clear a small workspace for assembling the filling later—a plate or a cutting board is fine. Remove bowl from freezer. Scoop 2 teaspoons of filling into your hands and mold into a flat disc. Set onto the workspace, making sure to space discs apart so they don’t touch. Repeat until you've made 12 discs. Set aside. 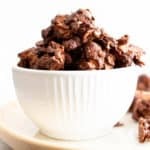 Melt the chocolate: Use the double boiler method or the following: in a medium, microwave-safe bowl, add chocolate and coconut oil. Place in the microwave and heat for 30 seconds. Stir. 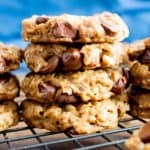 Heat again in 20-second increments until the chocolate chips are just softened and melty. Stir until smooth. Make the cups: Drop 2 teaspoons of melted chocolate into each muffin cup. Tap the pan to smooth chocolate into an even layer, filling the bottom of the cup. Gently lay an almond butter disc flat on top of the melted chocolate layer. Repeat for all cups. Spoon 2 teaspoons of melted chocolate over an almond butter disc. Gently spread until you get an even top. Repeat for all cups. Tap the pan a few times to even out the chocolate. Place muffin pan into freezer. Freeze for 15-20 minutes. Remove from freezer. Allow to thaw for 10-20 minutes. Peel off cupcake liners. Enjoy! Storing instructions below. 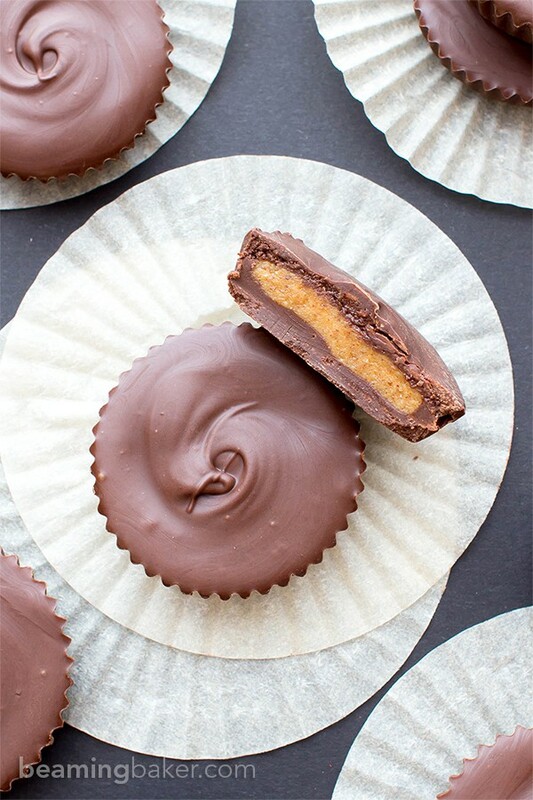 Adapted from my homemade Peanut Butter Cups. Also try my Paleo Vegan Brownies and my Vegan Coconut Truffles. 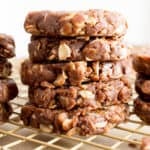 - *Make sure you use almond butter that only has one ingredient: almonds. Your almond butter should be naturally drippy and liquidy to work in this recipe. - Freezing instructions: store in an airtight container in the freezer for 1-2 months. Allow to thaw for 10-20 minutes before enjoying. 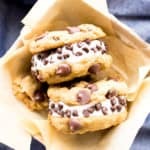 You are definitely a chocolate cup connoisseur and that’s surely a good thing to be 😉 I love all kinds – peanut butter, almond butter….whateves…they are all delish in my book! If you want to have a taste tester, I’ll gladly do that for you….hehehe. Pinned, of course! Have a wonderful weekend, Demeter!! I definitely have a thing for cups too…chocolate and non-edible ones! I love mugs and have to restrain myself from buying them. It just makes my coffee and tee that much more fun! 🙂 But these almond butter cups…I think they would quickly become my favorite. Such a great idea, Demeter! I am HOOKED on almond butter, so I know these would last all of 2.5 seconds in my house. What a great treat for the fall! Pinned, of course! Hope you have a wonderful weekend! Isn’t these cups just amazing? I mean, almond butter and chocolate… delicious combo! Love healthy snacking so THIS is just perfect. PS I love the roles you all have this year 😀 You as Hulk… LOL! Sharing this! 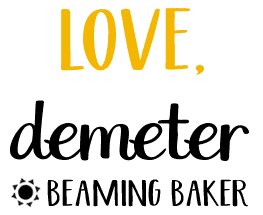 Have a lovely weekend Demeter! Cheers! 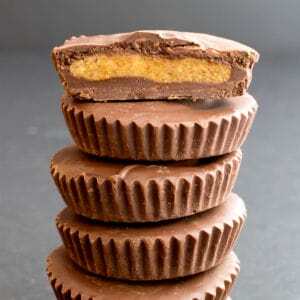 I think we need some hazelnut butter cups next! Like…nutella cups…but vegan and delicious! These little lovelies would not last long in our home. I bet you will have trick or treater lined up around the block once the word gets out. Demeter, those pretty swirls get me every time! Swoon! Just fyi, two of my nephews are going as the same thing that they did last year as well, both ninjas 🙂 I love that you made some paleo cups! You are definitely the queen of the chocolate cup, my friend! These are definitely making my chocolate dreams come true and yes, I’m grateful that they’re not a bowl of black beans… though, let’s face it, I wouldn’t say no to that either, because food. 😉 Pinning and bog hogs, D! P.s.s. you will make a wonderful hulk.. but you will need to buy a fat-muscle suit. I can see everybody around talking about Halloween, every other blog, the recipes, costumes and what not. Though I might not be in the middle of a celebration, I still feel so much a part of it that I can sense the spookiness in the air.. lol.. 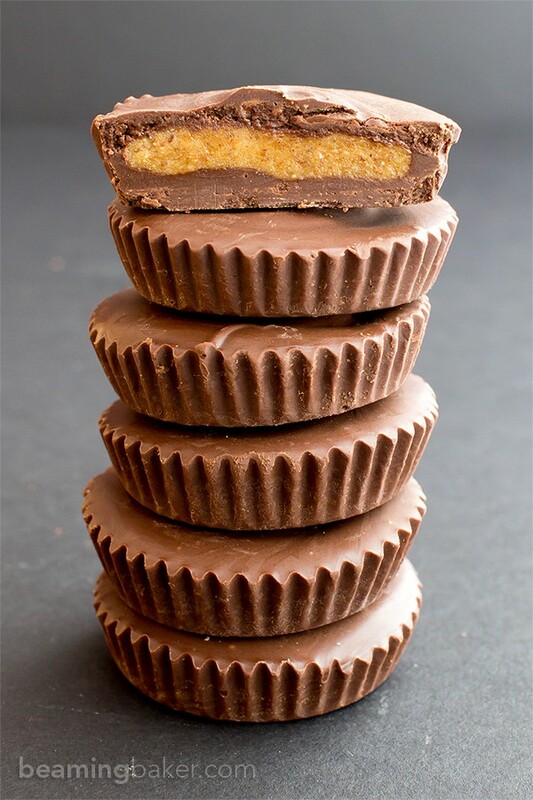 Your almond butter cups looks so delicious. 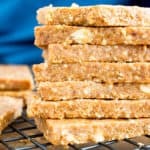 I have never had almond butter, but looks like your recipe would be the excuse to try it. I am so glad you rectified that the travesty of not having any paleo friendly almond chocolate cups, Demeter! Actually – you could fill these cups with pureed brussels sprouts or anything else and I will sit here on the other side of my screen and drool! You really do have a way with cups! BTW, your mom sounds like my dad – my dad would often tell us he couldn’t see, then one Christmas, he looks at my cousin (Dalo) and tells him “Dalo there’s chocolate frosting on shirt and your fly is undone!” ???? Now you are talking my chocolate language. 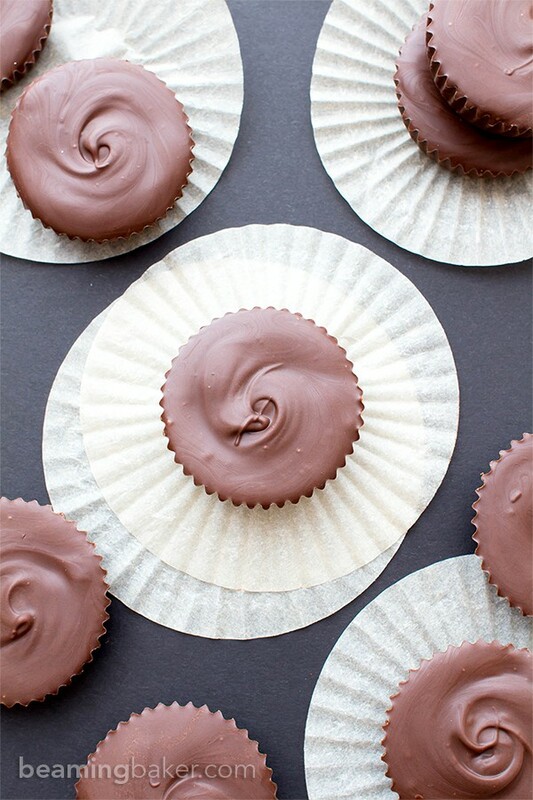 Chocolate almond cups are my fav and I’ll be making these with dark chocolate, fo sho! The hulk for you is awesome and bet your nephew is so adorable as Batman! We are going to a Halloween party tonight and I’m going as Bob Ross and J (hubby) is going as the happy tree. lol! Maybe next year we can go as a cooler couple, like Black Widow and Hawkeye. Please ask Grams if we can borrow her outfit for next year. hahahaha! I love these chocolate cups! Swapping the peanut butter for almond butter is such a great idea! Aww PB is SO cute!! Also, Wonder Woman for mom?! Can you get any more adorable?!!! Anyway cup queen (LOL) loving these almond butter cups! I made some way back when – and just looking at these I know how delicious they must be! Well, there is definitely something in the air connecting us, because we spent yesterday helping to make my 8 year old nephew’s costume – he is being (you guessed it) HAWKEYE! 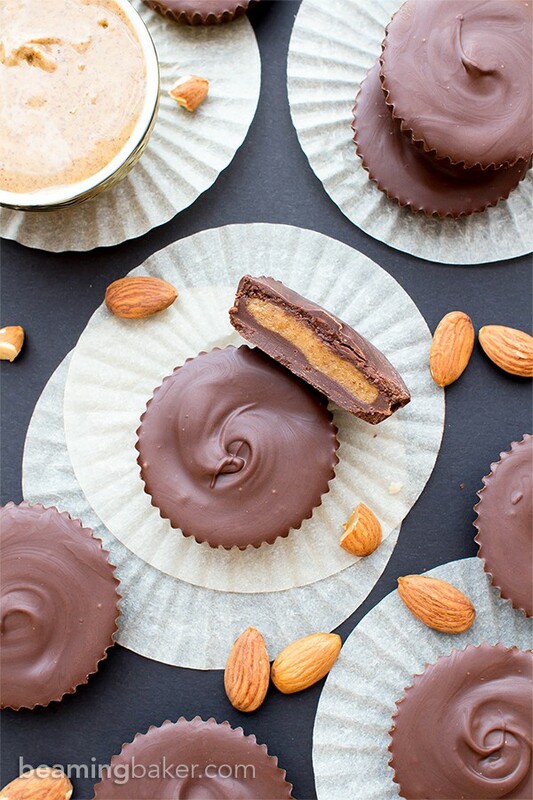 Meantime, love the almond butter spin on these irresistible chocolate cups – YUM. These are absolutely delicious. I followed the directions exactly, but for some reason the chocolate definitely melts in your hands and becomes messy quickly. Is there anything I can do to prevent this? 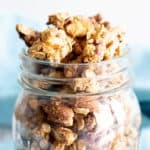 Not sure if this was answered yet or not but would you consider this recipe keto friendly? I am new to the diet so it seems like the flour would be an issue but I am not sure. Hi Maria! 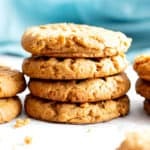 I’m not an expert on the keto diet, but as far as I know, coconut flour should be just fine. 🙂 Best of luck! Hi , these sound amazing. Can’t wait to make them. Question… How do I find out the nutrition facts?